Giving gifts to others is a fundamental activity, as old as humanity itself. Yet in the modern, complex world, the particulars of gift-giving can be extraordinarily challenging. In my view, the best gift is one that benefits both the receiver and the planet. So let me propose three categories of gifts for this holiday season that I believe meet this standard. A box of high quality dark chocolate: Good dark chocolate (with at least 70 percent cocoa) really is a healthy treat you could consider, especially for the women on your list (chocolate consistently ranks as the number one craving among women). Chocolate is a source of polyphenols, the same kinds of antioxidants found in red wine and green tea. The fat it contains is mostly stearic acid, which doesn't raise cholesterol levels. And the flavonoids in dark chocolate are good for the heart - they reduce the stickiness of platelets, inhibiting blood clotting and reducing the danger of coronary artery blockages. For those on your holiday gift list who like chocolate, splurge on a box of the best. 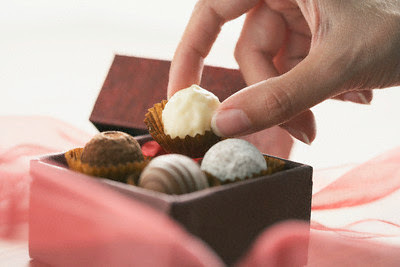 The review website Yelp.com can help you find the best chocolatiers in your city. You may also choose to give fair trade or organic chocolate; an internet search can provide many sources. Flowers: A beautiful bouquet or a long-lasting flowering plant is a traditional gift for women, but I have recommended that both men and women keep fresh flowers in the home for their beauty, fragrance, and the lift they give our spirits. A massage: A gift certificate for a soothing massage. Some types of massage are more relaxing than others, such as Trager work, a gentle system that uses rocking and bouncing movements to lull you into a dreamy altered state. Music: We're all affected by music. It has the power to inspire, uplift us, change our moods, and even alter consciousness. Almost anyone would welcome a CD or two, and for special people on your list, tickets to a concert would be a memorable treat. If you are unsure of the recipient's musical taste, give a gift certificate for MP3 downloads. A session with a personal trainer: This would be a great gift for someone who wants to get more exercise in the new year. Extra virgin olive oil: A bottle of high quality extra virgin olive oil is sure to please the health-conscious cooks on your list. While my personal favorite is Lucini Italia, a trip to a gourmet market (or a farmers' market in some cities in the southern U.S.) should provide you with many possibilities. Depending on your budget, you could put together a sampling of two or three bottles. Nuts: Walnuts, almonds, pistachios and cashews contain healthy monounsaturated fats that can lower your risk of heart disease and heart attack. And then there are gifts that you give to the larger world. It would be a generous gesture - and very much in keeping with the true spirit of the holiday season - to donate some or all of the money you normally spend on gifts to environmental protection, disaster relief or other causes close to your heart. You can do this as a gift directly from yourself to the less fortunate, or you can make it a family tradition to divert some of the funds you would normally spend on gifts for each other to worthy humanitarian and/or environmental causes. Talk it over within your family - you may be surprised at how open others are to the idea.If funds are short, as they are for many this year, your charitable gift can be one of time. Soup kitchens, food banks, homeless shelters and other community organizations often need hands-on help. Volunteers of America is one of several clearinghouses that connect people with organizations that need them. Finally, in this age of far-flung family members and challenging economics, consider telling your loved ones that their presence is a gift in itself. I know that personally, there is nothing I appreciate more than close friends and loved ones who have spent time and effort, and sometimes traveled great distances, to be with me during the holidays. Renewing and strengthening our human connections may be the best gifts we can give others - and ourselves. Andrew Weil, M.D., is the founder and director of the Arizona Center for Integrative Medicine and the editorial director of www.DrWeil.com. Become a fan on Facebook, follow Dr. Weil on Twitter, and check out his Daily Health Tips Blog.